J&K Government Recruitment 2017: The Housing and Urban Development Department, Government of Jammu & Kashmir release the notification for 56 municipal and civil engineer through the official website www.jkhudd.gov.in. Every year the Government of Jammu& Kashmir recruiting the more number of unemployed candidates. So, the candidates who are successfully completed their Graduate or Post Graduate and searching for a job in Government sectors, this is the best opportunity for everyone. For the Municipal and Civil Engineer positions of Jammu&Kashmir Government, the application process already started and this process will be closed on 28th April 2017. So, guys, the eligible applicants must apply before the Last Date. This is the best opportunity for who belongs to the state of Jammu&Kashmir. The more details about the J&K Government Recruitment 2017 are given below. The J&K Government, release the notification for 56 positions of Municipal and Civil Project Engineer positions, this was the state level recruitment. The application process will be closed on 28th April 2017. So, guys, the interested candidates must apply before the last date of the application Process. The details about the Interview or examination date and time for the position of the J&K Government recruitment will update soon. After the interview, the selected candidates need to certificates verification by the Management of Housing and Urban Development Department, J&K Government. Check more J&K Govt Jobs And More details about J&K Government Recruitment 2017 like Notification, Job Type, Application Starting and Ending Date, Official website of the organization and other details are given below. For more recruitment notifications just click on www.sarkarirecruitment.com. The Notification Details of Jammu&Kashmir Government, Municipal and Civil Project Engineer job recruitment for the year of 2017 are given below in table format. The below given table have the details of organization Name, Number of positions, Type os Positions, and other details are given below. For more recruitment notification visit the www.sarkarirecruitment.com. Each and every candidate must know about the qualification and eligibility criteria before applying to any Interview or for any job openings. So, fro this Housing and Urban Development Department, Government of Jammu&Kashmir, Jobs the required details are given below. The applicants who want to apply for Municipal and Project Engineer for Housing and Urban Development Department, in Jammu&Kashmir must have Graduation or Post Graduation from recognized University. and must have 3 to 5 years of experience in the relevant area. For more Qualification details check the official Advertisement of Housing and Urban Development Department, the Government of Jammu&Kashmir. 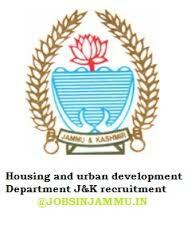 The applicants want to apply for the Positions of Housing and Urban Development Department, J&K Government the Age Limit from 18 years to 40 years fro the year of 1st January 2017. The more details of Age Limit must the check the Offical Notification of J&K Government. The candidates who had interested in Municipal and Civil Engineer positions in Housing and Urban Development Department, need to pay: Rs.500/-. Open the official website, www.jkhudd.gov.in. And check for the Recent Notification. Download the Application and take a hard copy. Dear, candidates we hope well the above given details are more helpful to your successful career. If you have any queries feel free to contact us and search for more recruitment notification in Sarkari Recruitment. Thank You.